The Four of Pentacles is the fourth card in the suit of Pentacles. A somewhat positive card, you should expect some good things to happen when you see it. Watch out though, it has specific meanings that you might want to be careful with. The Four of Pentacles represents possessiveness, material stability and providing for yourself and others. Past – The Four of Pentacles in the Past position can mean that you’ve set yourself up for the current position you’re in, most likely by hanging on to something in a material sense. Letting go of the past and breaking bonds is a natural way to move on, and sometimes a good way. It may seem difficult to even consider it, but thinking about it won’t hurt. It can also mean you may reconnect with something from your past; a childhood toy, or another lost item. Expect good memories to flood back. Present – The Four of Pentacles in the present position can mean that you’re holding on to things that you deem important. In the long run, remember that you can’t take them with you. Nobody, on their death bed, wanted to spend more time in the office making money. Understand what is most important to you. Material possessions, like everything, are transient. They will always come and go. realise that whatever you have now can change, and we are always living in a state of flux. Future – The Four of Pentacles in the future position suggests a sense of security in the form of material goods and finances. On the earthly plane you will be catered for. It’s time to look into what you really want to spend your time on this world doing. Look at the illustration on the card. 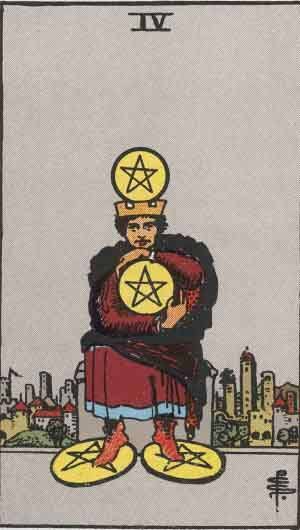 The central character is standing on the Pentacles as well as holding one, and having one on top of his head. Financial wealth is his foundation, wealth is his property and wealth is in his thoughts. Do you want to be like this? Work / Education – The Four of Pentacles in regards to work or education is a difficult reading. Make sure you aren’t working for the wrong reasons. Do you even like your job? If you’re looking for a new job and it pays more, consider if it’s the right move for you. Fringe benefits and location will be another important aspect to think about. Try to follow your ethics and passions over how much you’re going to get paid. Romance – The Four of Pentacles in romance can mean that you’re clinging on to something that isn’t good for you. This can be either a current relationship or lack of relationship. You might have your own little happy bubble that you live in, but you’re going to need to go outside of it to experience real romance and love. Comfort is a good thing in life; we all love feeling comfortable, but don’t let this comfort turn into apathy. You live life, you don’t watch it go by. Friends – The Four of Pentacles in regards to friendship might mean that your current friendships are turning parasitic in some areas. Are you always the person who pays for things, or lets others do so? You have to give and receive. Don’t boast about the things you posses to your friends, they won’t like you for it and it serves no purpose. Money – The Four of Pentacles in regards to finances is a good sign in some respects, despite the mixed messages in the meanings above. You won’t be in a worse situation when it comes to money, but things probably won’t drastically improve. It’s a good card to draw if things have been hard recently, because you know they won’t get worse. Expect some sort of gain in any case, enough that you may be tempted to show off to others. Health – The Four of Pentacles is tailored more towards your mental well-being than physical. Don’t hold on to old grudges and gripes you have with people. Sometimes we remember things for years and they affect us greatly. It’s all well and easy to say ‘learn to let go’, but the right thing to say is ‘try to let go’. Letting go takes less effort than keeping it all bottled up, telling someone can help. If you’re feeling happy and healthy, then use yourself as an example for others. Help others, if you’ve been though the same struggles as them, you can reassure them that everything will be okay in the end. Spirituality and Mentality – The Four of Pentacles in spirituality further emphasises attachment to material goods. They serve us well in the real world, but you can’t take these things with you and sometimes, holding on to things will mean that you’ll miss out on the bigger goings on. In Reverse, The Four of Cups can represent a few things; a change of mindset being one, but also missed opportunities. You might start to see the world for what it really is, especially when it comes to gaining money and material possessions. You might try to take on minimalism, and this could be very good for you. We can clutter our lives up with belongings that we do not use, and giving them away can help others and ourselves. if you collect something, try to share your knowledge with others. Also, in a slight contrast, watch out in any deals you are going to make soon, including any high value purchases. Be sure you’re getting the best deal. Four represents the structure and foundation. Four, like three, can be very grounded in reality All fours symbolise this. The Four of Pentacles strongly represents an increase in material gain. If you’re a collector, expect to find something rare and valuable. If you have many fours in a reading, it is a strong indication that you’ve planned well and now you’re reaping the rewards. We’ve selected live tarot readers to give you a FREE 3 Minute interpretation of The Four of Pentacles! Scroll through them below and pick your favorite one.